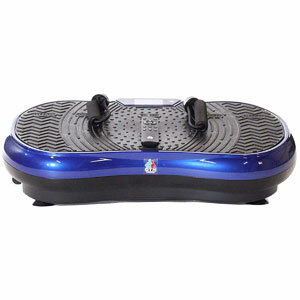 Is The Gym Master 2700W Crazy Fit Vibration Massage Plate User-Friendly? The Gym Master 2700W Crazy Fit Vibration Massage Plate is another brightly coloured device that aims to bring the intensity of a gym vibration plate to a more bedroom-friendly model. This devices has a 2700w motor to deliver great speed settings, but also a silent drive to keep noise levels down. Little details like self-levelling feet and a Bluetooth speaker add to the appeal. Is there enough here to keep uses entertained and on track with their fitness goals. Is There Too Much Going On With The Gym Master Crazy Fit Vibration Machine To Be Appealing To Users? There are some vibration plates that work on the idea that small and compact is best – then there are those that take a completely different approach, like the Gym Master Crazy Fit Vibration Machine . Here we have a machine that aims to be large, effective and gym ready. There are promises of versatility in the workouts, high power and plenty of features to add to the convenience and ease of use. There is the promise of effortless weight loss with features that are “suitable for all experience levels”. Is this the case, or is it all a bit too complicated?